Counting it as a win! Today was one of those days in parenting where I thought “you are really making it difficult for me to be the parent I imagined I would be” It was a tough day. Jack cut his first molar late last week and I am sure that there is another one nipping at that first one’s heels! Here is what happened today. We were running late to swim and Jack had to eat breakfast in the car. Which was milk and one bite of a banana because he refused all else. Bloody murder screams about using the belly belt at swim class. That’s fine, I took it off. But it was loud. Other than that swim was great. The Y told me I had to get a card or something. They changed their rules since our last visit 2 weeks ago and I didn’t know. I had to get a lovely (sarcastic) photo taken. Jack had to be patient after swim. I gave him most of a Kashi cereal bar. I forgot my wallet at home. I was planning on going right to the grocery store after swim, so we had a small detour. Not Jack’s fault, totally mine, but it set the tone. I didn’t eat breakfast but I DID work out. I ran out of time and frankly, the bananas that were left besides the one good one I was giving Jack were gross. Naturally I could come last in the eating department, the good banana was for him. Too bad he didn’t eat it! At the grocery store around the bakery area, which we were 90% done, Jack grabbed a box of pumpkin whoopie pies off a display. He insisted on eating them right.that.second. I am adamantly against that behavior in a store. Snacks we brought with, fine. Snacks we plan to purchase at the end of our trip, no. That is rude and uncouth. Once they are scanned and I know I have my wallet and am going to pay, that is fine. So he had to wait. He was not happy and let everyone know. I ended up carrying him. Immediate insistence on the aforementioned whoopie pies when he saw the cashier take them out of the cart. 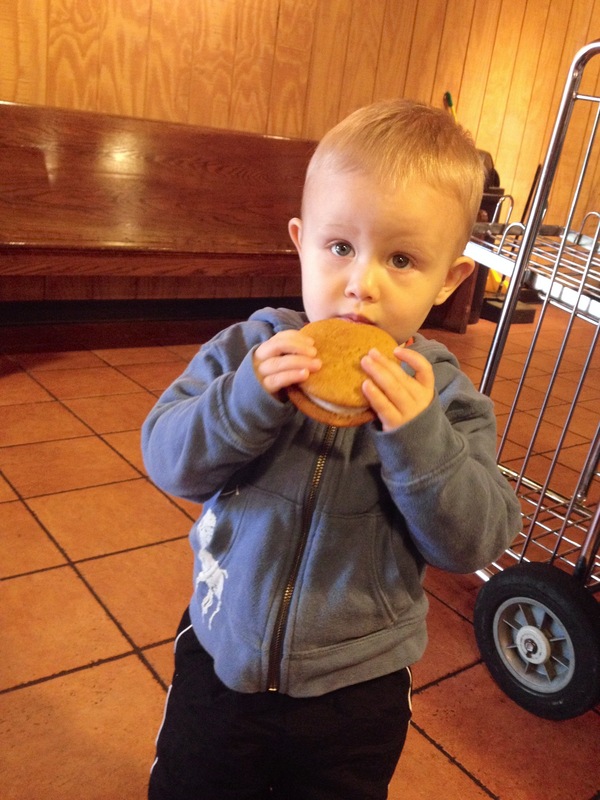 So he got a whoopie pie while we waited. Jack decided when he was done with the whoopie pie to whine the whole way home from the store. Refusal to eat any lunch after nap time. I even made a grilled cheese and cut up strawberries, a sure favorite of his. Nope. Just wanted milk milk milk. I refused more milk unless he ate. That resulted in tantrums galore. He kicked over a water cup because he didn’t want WATER he wanted MILK. He got a time out for that one. Still angry after the time out. I decided to ignore his cries after that. I heard him messing around with his time out stool. Peeked, thinking he was defacing it again. He wasn’t. He put himself in time out. Was sitting on it. I left an went back to preparing dinner. A minute later he came up and hugged me and asked me to carry him, which means pick up. His mood then improved. After a convo with my hubby we decided he can have mostly milk right now since we are certain his mouth hurts. He refused sweet potatoes for dinner. But the general crankiness vanished. So all of that together is frustrating. I felt like he got lots of junk food early on just to appease him at the moment. Which makes me feel like a failure. I am so health conscious with food that often I am racked with guilt if he eats too much crap in one day. Realistically he eats much healthier than a lot of toddlers, but it still bugs me. I was strict though and no more junk the rest of the day. BUT there were a lot of great moments today too. A LOT! Most seemed to happen after that self imposed time out, hey we all need one of those once in a while! But a few were earlier too. He was super excited for the pool. He didn’t even need to bring a car with him! He was kicking and scooping up a storm!!!! He was awesome while we got changed after swim. That is hard because the locker room is FREEZING! For 90% of the shopping trip he happily played his games on the ipad. He played happily while I organized things for my pilates session with my mom. He let me get what I needed to get done. This was after his nap and before the time out incident. For some reason there is a smiley face on the bottom of my white sock. I think it was from eyeliner shavings, I was in a crazy rush this morning and one of my eyeliners is all jacked up. Anyway I think I stepped on shavings and somehow it formed a perfect smiley face. Jack saw this later, I had no idea was there, he started pointing to my sock saying “ghost ghost” I looked and he was right, it looks like a ghost! It cracked me up. He sees things and thinks outside of the box. We bought fish!!!!! 8 fish or sharkies as Jack calls them!!! 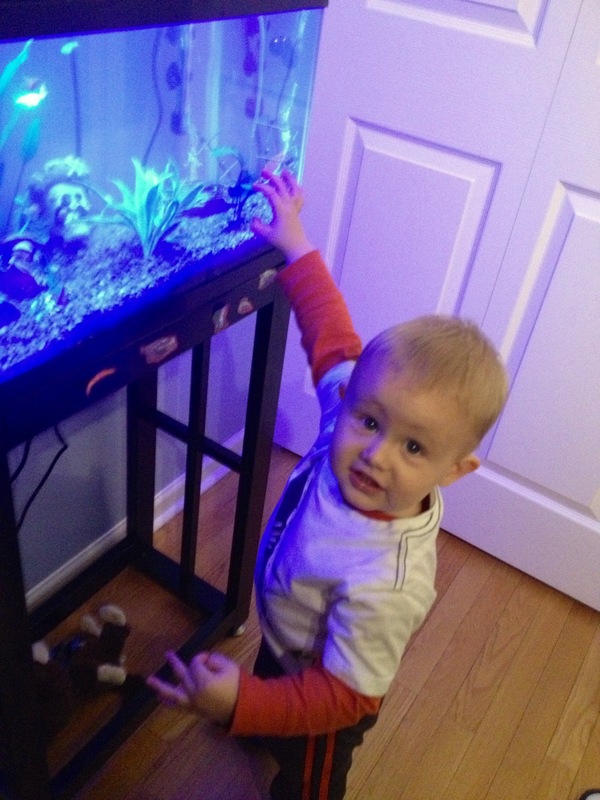 The fish tank is in his room! He listens very well when I need him to stay by me. When we entered the actual pool area I had to put our towels down. I tell him to “stop please and wait for momma. You can’t go near the water without momma or another adult” He stopped in his tracks and waited for me. When I have to put all 30lbs of him down to unlock the car (I misplaced my clicker) he stays by me as I instruct him to. He did not try to wander off. This is very normal for him but I want to share it because it is really great that he listens to my safety requests. I try to reinforce it daily. It has been showing! Way to go Jack! He spent a lot of happy quality time with my mom today. He was obsessed with her. They laughed so much!!! I loved seeing that. He said “crayon please” to me while we were coloring instead of taking the crayon I had out of my hand. He put raffle tickets in my pant legs for about 30 minutes for no reason other than it was fun. It was pretty cute. 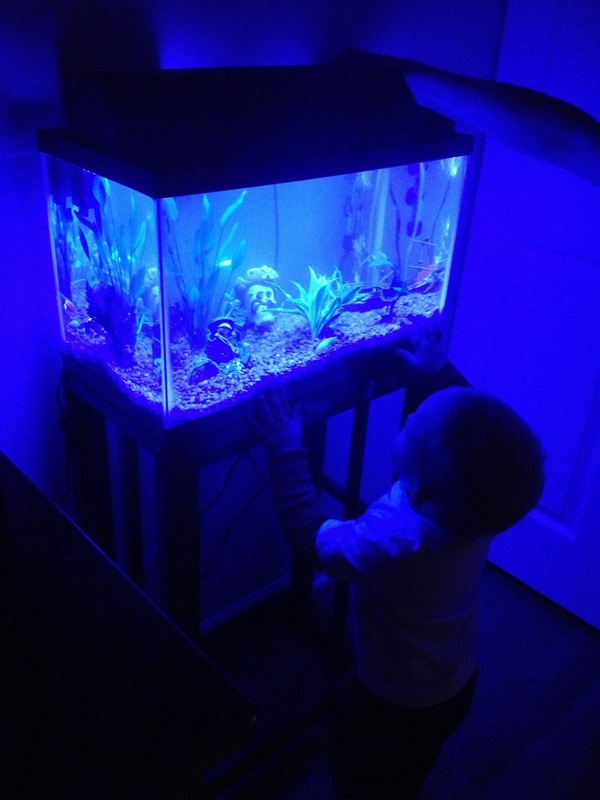 We played in his room and visited with his sharks. We named the green one Jen, since he has THREE important Jens in his life and his Great Aunt Jenny requested one be named Jen. I named the purple one Joseph Pilates and the blue one after my husband’s company. Good story time before bed! So I try to look at what went well. A large portion of the day was a bit stressful but it is what it is. There were many joyful moments as well. I am not a perfect mom. I lost my temper a time or two and scolded him. One time was after he tried to pull the cats tail and lost his balance and fell on her. She screeched and ran away. I scolded him and laid him down to change his diaper. He had to air out because of his diaper rash. So he stayed on the floor watching his show. I sat on the couch and breathed for a few minutes. When I got up to put on his cream and diaper I hoovered over him, he reached out for me and smiled, and I bent down to hug him back. We hugged for a few seconds, very tightly. I told him I loved him a lot and I was sorry to yell but he needs to be gentle with the cats or they will hurt him. I kissed his face. Then finished the diaper change. I love him dearly and he loves me the same. Life can be hard and stressful and sometimes we don’t see eye to eye, like I think he should eat leafy greens and he thinks he should eat whoopie pies….But in the end we figure it out, forgive each other, and share our love freely! He still didn’t eat his leafy greens or his sweet potatoes but he did eat frozen grapes and whole grain all natural bread. That was better than nothing and better than whoopie pies. So I count it as a win!